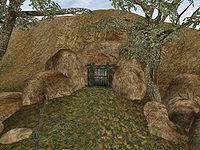 Dubdilla is a cave containing daedra way south of Tel Vos. 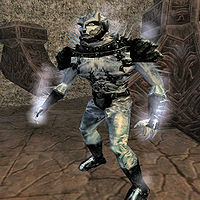 Upon entering, you'll see a three-way split, one brings you to a room with a leveled Daedra, another is a cliff (you need levitation or good jumping to get back up) and the last one is a room that has a peaceful person, Cumanya, who doesn't have much to tell you and seems to live here. If you look at her bookshelf, you'll find a note saying the uncharted caverns are highly dangerous. If you do choose to go in, jump down the cliff east and open the locked door. You'll enter a maze of tunnels and underwater passages, some of which will be a dead-end; the easiest path is going north, following the tunnel around south back to the center. 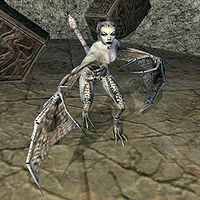 There are several leveled Daedra in the area, including Hungers. If you enter the Lower Uncharted Caverns through the center entry, you'll need to levitate to a ledge with a door with a Storm Atronach behind it. Make your way east to confront Molag Grunda and her consort. Next to Cumanya are various summon scrolls, the skill-books Feyfolken II (Conjuration) and The Cake and the Diamond (Alchemy), a set of journeyman-level Alchemy Apparatus, and an Old Key that opens the Stone Cavern Door to the Uncharted Caverns. Levitation is a helpful spell to have while exploring the uncharted caverns. You can bypass all the waterways by using holes in the walls around the cavern which will lead you to most of the areas and to Molag Grunda. The majority of the loot in this cavern is only available to characters who are doing the related quest. If you discover this cave when not on the specific quest related to it, you will find the entrance to the final cavern and "boss" fight blocked by an impassable rock fall. If you have no intention of becoming a vampire and needing a cure quest for it, and want to battle Molag Grunda for fun, use the ToggleColliision (TCL) Console command to pass through the rocks (and again on the other side to turn collision clipping back off again); repeat to exit. On a ledge in the southern Lower Uncharted Cavern is a skeleton with a random melee weapon, along with a Demon Longbow and two potions. A dead Scamp in the area is also (uncharacteristically) bearing a random weapon. In the room where you find Molag Grunda and her consort, there's a structure that can be reached by levitation. Here you'll find a total of three chests and an urn. The chests hold a decent amount of gold, a random daedric weapon, and several enchanted items. The urn has a collection of scrolls. This page was last modified on 9 February 2019, at 13:15.